A marketer’s challenge is in distinguishing between high-performing and under-performing campaigns. Those with simpler marketing mixes may have something as simple as a social ad on one day and an email blast on another. For this example, distinguishing between the high- and under-performing campaign might be as easy as comparing click-throughs for a social ad on one day and click-throughs for an email on another. But for others with complex and multiple concurrent marketing campaigns, attributing revenue to specific campaigns is not as simple, especially if prospects are touched by multiple marketing campaigns before ultimately buying. Figuring out which marketing campaigns have the highest impact on revenue involves giving credit from a sale across multiple campaigns. To get revenue attribution right, different methodologies have been developed and adopted by marketing teams of all shapes and sizes, and we walk you through how to choose the right one for you in our Attribution Model Series. In Part 1 of the series, we go over simple, “single touch” attribution models. In Part 2, we dive into more advanced, “multi-touch” attribution models. In the final part, Part 3, we enter the frontiers of sophisticated models with custom factors outside of just touch. Without any further ado, let’s start! Single touch attribution models are attribution models that allocate 100% revenue credit to a single campaign. Variations of these models allocate revenue to different campaigns, for example, the “first touch” or “last touch” campaign. For example, you may allocate all of a deal’s revenue to the first campaign that touched the lead. While simple, the advantage is in the ease of understanding and explaining the attribution to others in your organization. And while not complete, the limited insights gleaned can still be informative depending on your goal and the touchpoint you choose. The question is: which touch should you pick? I’ll walk you through a couple of standard single touch attribution models and one that we call the “tipping point” model. First touch attribution is mainly for those who focus on distinguishing sources of new leads (in other words, origination). It’s pretty simple for execs to understand lead origination: 1) a lead came from a webinar sign-up, then, 2) that lead later bought the product. Case closed. The downside of this model? This unfairly omits the impact of any campaigns beyond the first touch. So, if you have nurture campaigns, your attribution model would not tell you that they’re effective, potentially leading you to under-invest in them. Moral of the story: first touch attribution will tell you a great amount about your new-lead building, but it can mislead you to invest away from the most effective marketing campaigns overall. Depending on your business, last touch could be defined as the absolute last touch chronologically (less meaningful) or the last touch that qualified the lead enough for it to become an opportunity (Full Circle’s view). Ultimately, you get to decide the components of your attribution model to make it work for you. Either way, last touch attribution works best for marketers who want a simple way to glean insights into the last touch that drove conversion. If a lead’s last touch with you is an influential purchase-driver, this is an effective way to invest in the right campaigns. However, what if the last touch had little or no influence? Let’s take Google’s last click as an example. 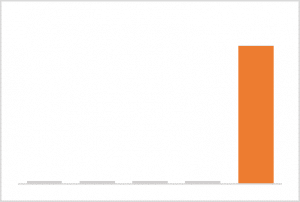 While Google’s paid search ads tend to be the last click for many companies, do they really drive purchases? Googling “Walmart” is more of a matter of convenience (“I want to get to Walmart.com”) than buyer research (“what is Walmart?”). For your company, was that last asset download really a driver of the closed deal? If the last touch campaign does not drive purchases, this attribution would provide misleading insights. For any last touches, consider factors that could confound the analysis, such as the influence of the campaign, the relevance of content, timing of the touch with the actual purchase, and other potential misalignments between last touch and influence. We at Full Circle Insights call a lead who has converted from the marketing stages to a sales stage of the funnel (i.e., has become marketing qualified or has exceeded a lead score threshold), “tipped”. The tipping point is the touch that created this sales engagement. Knowing which campaigns are most effective at the tipping point enables you to prioritize nurture programs and mid-funnel campaigns that work or prioritize the marketing-to-sales handoff. This works well for companies with a particular focus on the marketing-to-sales handoff in the funnel. Typically, companies using the tipping point attribution model have at least a moderately sized marketing funnel and likely have implemented some sort of lead scoring. While we at Full Circle Insights are a fan of this “mid-stage touch” model for many B2B companies, there are some caveats to be aware of. 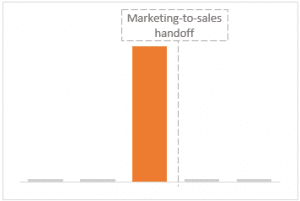 There can be touches where the marketing campaign happened to create a sales engagement due to timing but didn’t significantly contribute to nurturing the lead. For example, you can imagine a lead score threshold of 100 and a lead with a score of 99. A 1-point email campaign would push a lead from 99 to 100 and would be deemed the tipping point. However, this email campaign may not truly be influential. So, there is a level of self-selection bias here because your inputs for scoring campaigns affect the selection of the tipping point, highlighting the importance of ensuring the intellectual honesty of the data. I hope some of these points help you think about your company and goals in your assessment of attribution models. 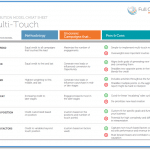 To summarize, first touch models are useful for growing your lead lists, and later touch attribution models (such as last touch and tipping point) are for targeting existing leads. In wrapping up single touch attribution models and before moving onto multi-touch ones, I wanted to touch upon a final variable for picking your attribution model: dedicated management resources. From our experience in serving customers with the Full Circle Campaign Influence product, single touch attribution models are oftentimes chosen by organizations who feel as though they don’t have the focused resources to use more complex models. It’s an understandable sentiment. Once the attribution models become more complex, they require some additional thinking in setting up the model and interpreting the model, especially for other stakeholders such as executives and sales team members. The good news: the more sophisticated models come with their own rewards, especially since they might better align with your organization’s business intelligence expectations, unique lead lifecycle, and ultimate marketing goals. In the next installment, Full Circle’s Attribution Modeling: Part 2, we walk through the ins-and-outs as well as how to consider multi-touch attribution models, including even spread, U-shaped, W-shaped, and custom-weighted. We’ll see you soon!